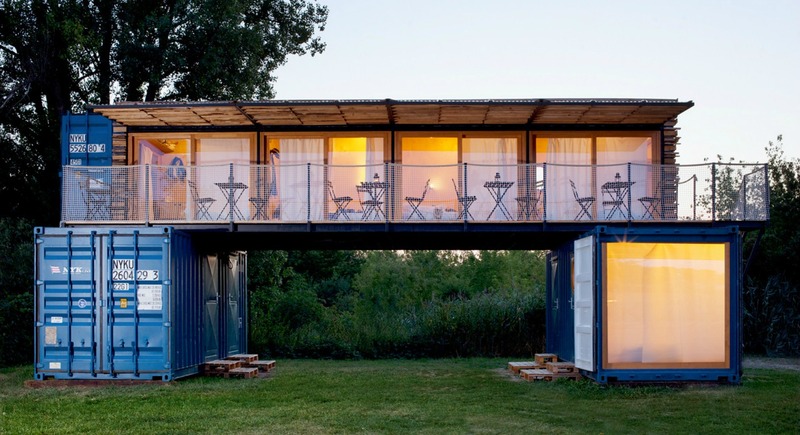 Prague-based firm Artikul Architects has managed to combine two of our favorite things: shipping containers and wanderlust. 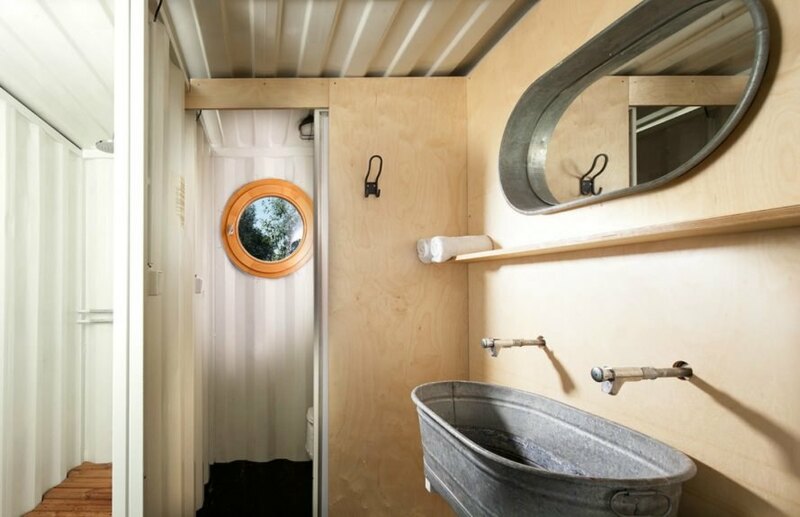 The ContainHotel is a small boutique hotel made out of three repurposed shipping containers that can be easily disassembled and transported to different locations. 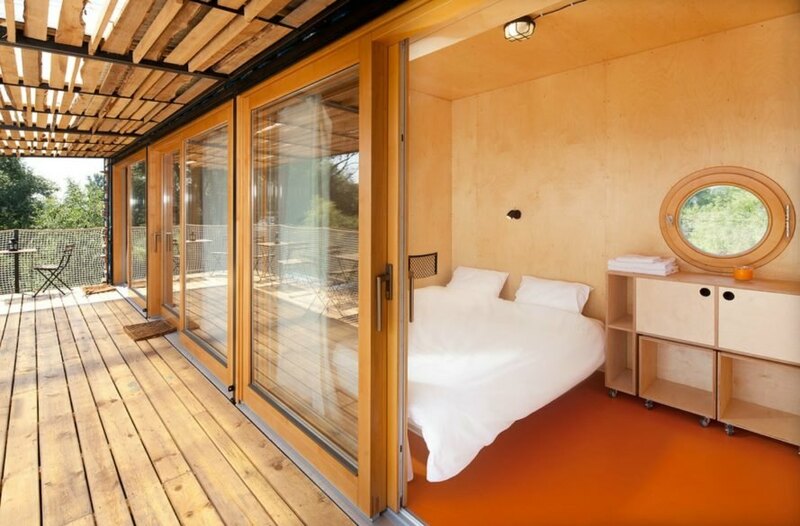 The eco-hotel is made out of three large shipping containers, but has a total of five rooms that can accommodate up to 13 guests at a time. A horizontal row of four rooms was built into a 40-foot high cube container, which is supported by two perpendicular 20-foot containers on the bottom level. The ground level containers house the sanitary facilities, a technical room, a storeroom on one end and a four-bed guest room on the other. Although compact, the rooms are open and airy, with minimal, but elegant features on the interior. Large windows provide tons of natural light for all of the rooms. The interiors are clad in birch plywood, which was also used for the custom-made furniture. All of the rooms open up to an elongated shared balcony that provides great views of the surrounding nature. 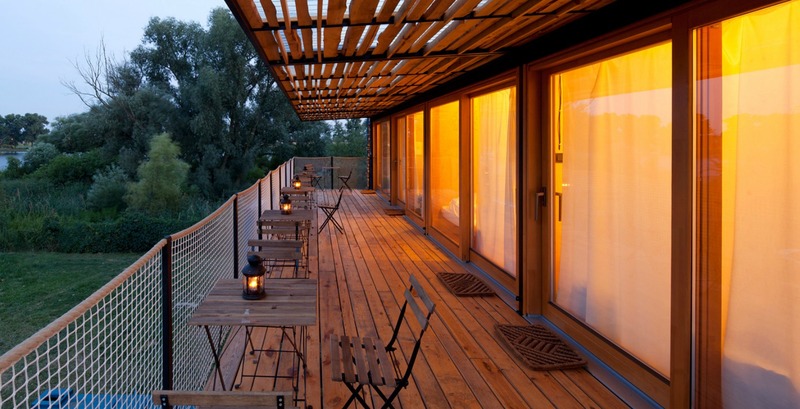 Currently located in in Treboutice, Czech Republic, the hotel was designed to be a self-sufficient, eco-friendly hotel that can be easily demounted and transported to multiple locations. The structure was built on railroad sleepers to leave minimal footprint no matter where it is assembled. The building is connected to a local electric power source and has an integrated water reservoir that supplies the showers and sinks, all installed with water saving taps. To save on heating and cooling, the hotel awnings, which were made of reclaimed wood planks from a local sawmill, insulate the roof and provide shade in the summer months. Great idea and beautiful result! 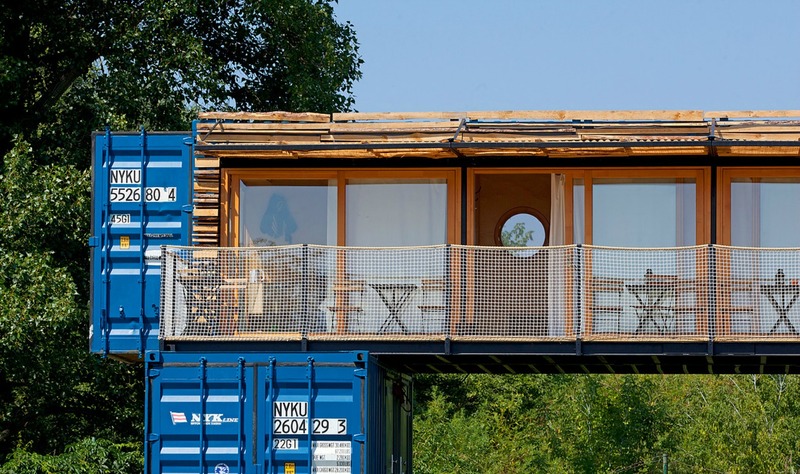 The hotel design is made out of just three large shipping containers, but has a total of five rooms that can accommodate up to 13 guests at a time. A horizontal row of four rooms was built into a 40-feet high cube container that is supported by a two perpendicular 20-feet containers on the bottom level. The ground level containers house the sanitary facilities, a technical room, a storeroom on one end and a four-bed guest room on the other. A shared balcony runs the length of the upper floor. The wood on the overhang is made out of reclaimed wood pieces from a local sawmill. The balcony offer views of the stunning natural landscape. Each room comes with its outdoor seating space. The compact rooms are open and airy, with minimal, but elegant features on the interior. Large windows provide tons of natural light for all of the rooms. The interiors are clad in birch plywood, which is also used for the custom-made furniture. All of the rooms open up to an elongated shared balcony that provides great views of the surrounding nature. 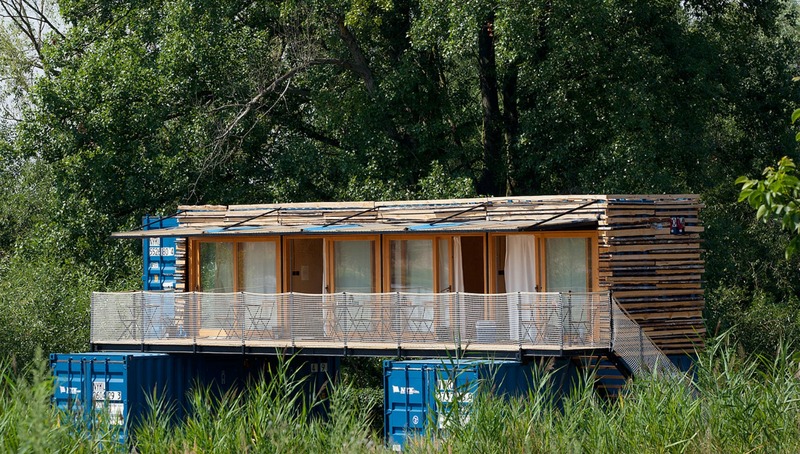 Designed to be a self-sufficient, eco-friendly hotel, the structure is easily demountable and can be transported virtually anywhere. 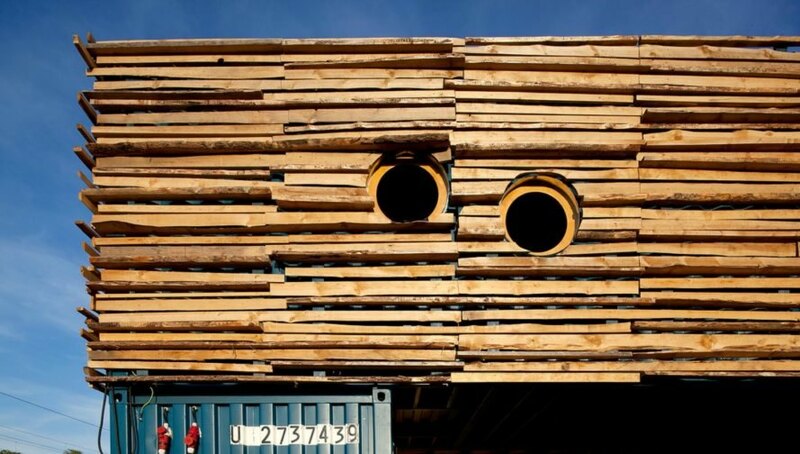 The containers were built on railroad sleepers to leave minimal footprint. The building is connected to a local electric power source and has an integrated water reservoir that supplies the showers and sinks, all installed with water saving taps. To save on energy costs, the hotel awnings were made of reclaimed wood planks from a local sawmill to provide shade in the summer months. 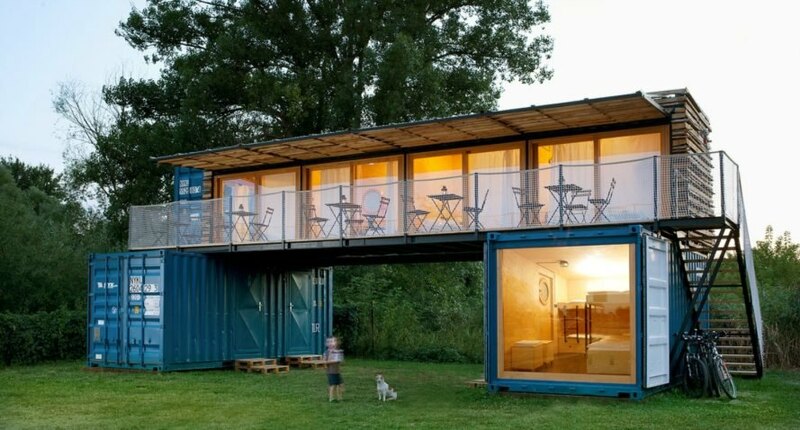 The ContainHotel was built out of three large shipping containers.